I started this post a while ago earlier this summer, and it looks like I finished it but never hit post. Oh well! I’m posting it now rather than deleting the draft. After several extra months of riding, my assessment of the Garmin 1000 hasn’t changed, except that I am even more impressed with its stability and ability to record ultra long 24 hour+ rides. None of the earlier Garmins could last that long without crashing! Large crystal clear display, easy to read in any lighting condition with auto-brightness enabled. In the picture above, compare the Garmin 800 (left) to the Garmin 1000 display (right). Both are displaying 10 pieces of information, but look how much clearer the 1000 is. Di2 integration, no more guessing about whether you are in the 28 or 26 in the back. Plus, being able to see a history of gears used in a KOM effort will be cool to see. Some of the climbs that Mark and I have been trading KOMs on can ultimately come down to using the right gears at the right time. Being able to compare times with the gears used may help optimize KOM efforts. Improved processor speed. The 1000 is much more responsive, able to lookup information on the map much more quickly, and able to calculate turn-by-turn directions for long routes more quickly than the 800. Most importantly, with an improved processor there is presumably less opportunity for deadlock leading to less frozen screens and lost rides. I won’t know this for sure until I get some really long rides done with the 1000. So far my longest ride after the accident has been just over 7 hours. The Garmin 800 was pretty reliable for rides under 8 hours. Once you hit the 8 hour mark, you better not try to do any routing or looking at the map with the 800. You are pretty much guaranteed to have the 800 freeze and possibly lose the entire ride. Improved map detail, plus free maps! Thanks in large part to the OpenStreetMap organization and the USGS, there is some excellent map data that comes standard with the Garmin 1000 instead of having to buy the City Navigator SD card to get good street data. Also, the entire collection of USGS named summits is included in the map data so that you can see a little mountain icon and click on it to see its exact elevation. See screenshot below. The new Personal Records feature is kinda cool, especially if you are coming back from an injury as I am – each time you set a new PR that is especially meaningful. Garmin 1000, USGS mountain closest to our house. Let’s start this off with a video showing you the differences in total ascent between the Garmin 800 (left) and the Garmin 1000 (right). Some things to look for in the video – note the iBike gradient stabilizes much faster based on the accelerometer (not barometric pressure). Even so, the Garmin 800 stabilizes much, much quicker than the Garmin 1000. Also, note when total ascent starts to accumulate on the 800 vs the 1000. Note based on the iBike grade how long you are on the hill before the 1000 starts to read any change in total ascent. Lack of Windows Phone support. Yes, I know that windows phones are a small (but growing) share of the market, but for people more interested in the camera (Nokia Lumia) than the phone, the current Windows Phone offerings blow away anything from Apple or Samsung. Also, lack of open API for communication between the Garmin Edge 1000 and the Garmin Connect mobile app prevents writing my own home-brewed windows phone app. I contacted support to let them know I was interested in writing a Windows Phone app to support live tracking from the Garmin 1000, but never received any response back. New location of the barometric pressure sensor behind the quarter-twist mount. While this may protect the sensor from rain, it is the nemesis of anyone who lives in an area with lots of steep rolling hills. The new sensor location causes the unit to respond much more slowly to changes in elevation, which means you miss the bottom of every climb. This is also true in large mountain areas, but since you are only doing a few climbs on a ride in the mountains it doesn’t matter much to lose 20-40 feet on each one. But if you are doing hundreds of hills on a ride, then losing 20 feet on each one adds up pretty quickly. The aggressive total ascent filter. It isn’t just the location of the barometric pressure sensor as it is also the “new and improved” algorithm for accounting total ascent. In the Garmin 800, the filter was placed on the raw elevation change. You had to climb more than 7 feet before the elevation changed, at which point every foot was counted towards the total ascent. Now with the Garmin 1000, you see small 1-2 foot changes in elevation, but these are not counted towards total ascent until some magic variable number (I think it is time based) of feet have been climbed. I think you have to have been climbing for 20-30 seconds before it starts to count total ascent, which means that the raw number of feet climbed differs based on how fast you are climbing rewarding slower descending and slower climbing. Too much to say about the stats and devices here for a thumbtyped caption. I think I might break out the blog today and write up my thoughts on the Garmin 1000. Definitely got some issues that occurred in previous devices eventually fixed in firmware. How do these same issues come up in a brand new device? You would think they would start from the already fixed firmware when writing the new firmware for the 1000. Note the blank “total ascent” field. Also note that the Garmin 800 recorded 12,271 feet of climbing, but the Garmin 1000 only recorded 10,629 feet of climbing. If I had mounted the Garmin 1000 in a normal fashion instead of using the out-front mount with the Garmin angled up at a 60 degree angle to expose the barometric sensor then the elevation difference would have been much, much larger. My lap tests showed a difference of over 40% in total ascent when the Garmin 1000 is mounted in a flat or slightly angled position. 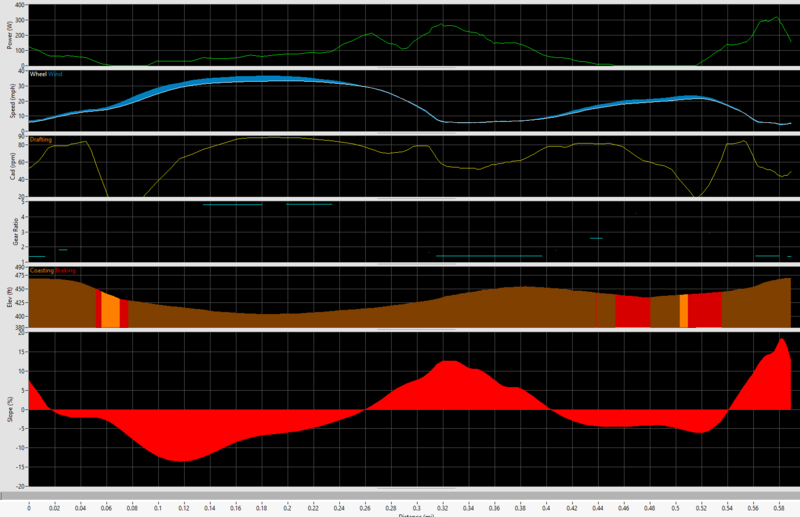 Also, note that the elevation graph doesn’t use all four sections no matter how much you zoom in or out. The PR feature is really cool, though, and fortunately it does show you your total ascent – but this is only after you end your ride and only if you actually set a new PR for total ascent. Otherwise, you are not able to see how much you have climbed if you climbed more than 9,999 feet. Most of my issues with the new Garmin are related to elevation. Other people in the Garmin forums have mentioned random screen locks and dropped bluetooth connections as problems. I haven’t seen either of these problems in the first 500 miles of usage because I am unable to use bluetooth at all. Perhaps the random screen locks are related to bluetooth, which means the lack of Windows Phone support is a blessing in disguise. Overall, I’m happy with the improvements made to the Garmin 1000 and once the elevation readings are sorted out – I’m planning on gluing something to the bottom of the Garmin to funnel air around the mount into the pressure sensor – plus hopefully a new release of the Garmin 1000 firmware will not have such an aggressive total ascent filter. Unable to use the live tracking feature on my Garmin 1000, I decided to write my own for Windows Phone. Without a published API from Garmin, there is no way for me to pull the data coming from the 1000, but I can track position, time, and speed on the phone itself. As I dug further into this, I found an already existing app that looks perfect and works on Windows Phone: locatoweb.com. This entry was posted in Misc and tagged equipment, garmin on December 19, 2014 by kartoone.